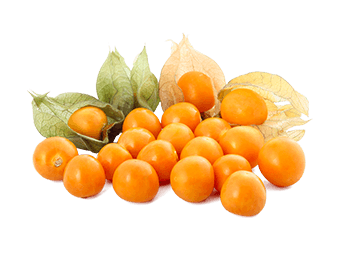 Goldenberry (Physalis peruviana L.) also known as Pichuberry, is native to high-altitude tropical Chile and Peru, where the fruits grow wild. This smooth berry, resembling a miniature, spherical, yellow tomato, actually belongs to the nightshade family that includes tomato, eggplant and potato. Goldenberries are rich in antioxidants, particularly carotenoids and polyphenolic compounds, which promote a healthy immune system and maintain optimal health. Antioxidants help to reduce inflammation, maintaining blood pressure and sugar levels in the normal range and promoting cardiovascular health. Golden berries also contain unique withanolide compounds similar to those found in ginseng. The high levels of carotenoids help promote healthy eyesight.